Your Android phone’s web browser features a multitabbed interface, where you can browse several web pages in multiple windows or tabs. Sometimes the tabs appear across the top of the screen; other times, they can be accessed by touching an icon. The following figure illustrates the multitabbed interface in the Chrome app. Touch a tab to switch to that web page. To open a link in another tab, long-press the link and choose the Open in New Tab command from the menu that appears. To open a bookmark in a new tab, long-press the bookmark and choose the Open in New Tab command. 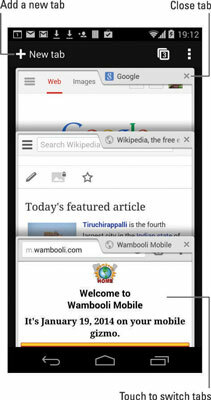 To open a blank tab, touch the Action Overflow icon and choose New Tab. 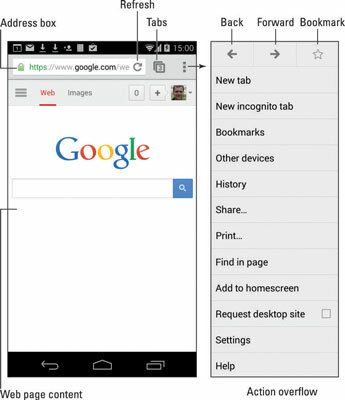 The New Tab command may display the browser’s home screen or the Bookmarks screen instead of a blank tab. Close a tab by touching its X (Close) button, which either appears on the browser screen directly or is shown in the tab overview. You cannot close the last tab. Some browser apps may refer to the tabs as windows. For secure browsing, you can open an incognito tab: Touch the Action Overflow icon and choose the New Incognito Tab command. When you go incognito, the web browser app won’t track your history, leave cookies, or provide other evidence of which web pages you’ve visited in the incognito tab. A short description appears on the incognito tab page describing how it works.